The Seattle Seahawks and QB Russell Wilson defended CenturyLink Field on Sunday night, defeating the Philadelphia Eagles 24-10. Wilson threw for 227 yards and three touchdowns while also running for 31 yards. He was aided by solid statistical performances from RB Mike Davis (16 carries for 64 yards) and WR Doug Baldwin (five receptions for 84 yards). QB Carson Wentz put up 45 attempts to get to 348 passing yards, although he balanced out his lone touchdown pass with a key fumble and an interception that essentially sealed the game for Seattle. RB Jay Ajayi led the backfield in carries, but he only managed 35 yards on the night. 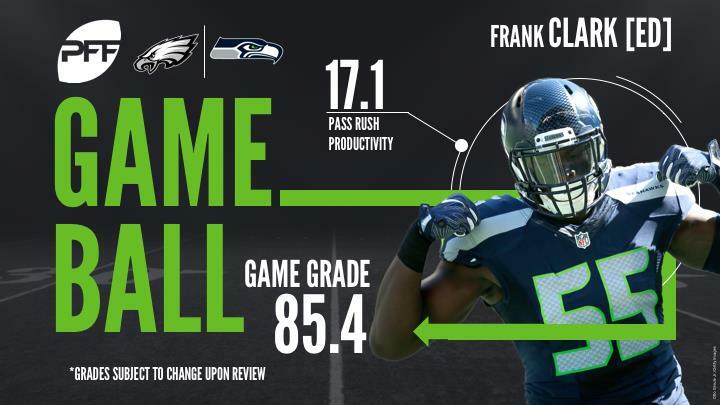 Both defenses were effective at getting pressure on the opposing quarterbacks, as the Eagles’ Brandon Graham and the Seahawks’ Frank Clark, both edge defenders, came away with more than a sack a piece. With that, we give you our PFF-exclusive takeaways from the contest for each team. No real surprise that Doug Baldwin was Russell Wilson’s favorite target, he was thrown at seven times, catching five balls for 84 yards, which led to a passer rating of 111.6 when targeted. After being limited to four catches the past two weeks, Baldwin and the Seattle offense will hope Sunday night’s game propels them to further success down the final stretch of the regular season. The numbers show that Wilson was under pressure on 16 of his 36 dropbacks, but some of that is contributed to Wilson, vacating a clean pocket to make throws on the run, something he has been doing since entering the league. When not blitzed, Wilson enjoyed most of his success going 17-of-27 for 176 yards and two touchdowns. Of Wilson’s 27 pass attempts, 19 were thrown within 10 yards of the line of scrimmage. Clark had a field day against the left side of the Philadelphia offensive line. Clark had two sacks, a hit, and five hurries on 39 snaps rushing the passer, the majority coming against LT Halapoulivaati Vaitai, who allowed 10 total pressures in the game. The Seahawks as a team were particularly effective with stunts, as the Eagles offensive line struggled at times to pass off defenders. Richardson was not far behind Clark’s performance as a pass-rusher. While he did not get a sack, he did match Clark’s eight total pressures on ten fewer pass rush snaps. He also added two stops in the run game. When the Eagles took Agholor in the first round in 2015, this was the type of performance they had hoped to see from him often. He caught seven passes for 141 yards, both career-highs and his first-career 100-yard receiving game. He caught his seventh touchdown of the year, tied for fourth-most among wide receivers this year. Not the best outing for the Wentz. His low point of the night was a fumble that turned into a touchback that directly cost the Eagles points. However, he didn’t throw the ball particularly well either, with too many inaccurate throws on the night. Wentz was under pressure on 58 percent of his dropbacks, the highest percentage of any quarterback this week. He started to turn it around in the fourth quarter, with two ridiculous throws on the opening drive, but it wasn’t enough to turn the game around in the end. Graham finished with two sacks and five total pressures, leading the way for a defensive unit that has a pressure rate among the best in the NFL. Graham played 23 of his 27 pass-rushing snaps from the left side but accounted for more success while rushing from the right side, recording two pressures on only four snaps. Jernigan was solid against the run for the Eagles, boasting a run-defense grade of 84.8 and two run stops. His run-defense grade was second to Mychal Kendricks, who recorded five stops but struggled in pass coverage, giving up 63 yards on six targets. Jernigan is has been reliable for the Eagles against the run all year, totaling 15 run stops through 11 weeks.